Fully featured, tough and stylish, the TLKR T60 is the ideal way to stay connected during outdoor adventures. Site Safety. Maximum Range : 8km. View this range. Product Number : P14MAB03A1AV. Maximum Number of Channels : 8. Floureon Battery. With a generous 3km range ( MAX 5km open field ) you can wander safely off around most venues, safe in the knowledge that your buddy is just a radio walkie talkie call away. This 2-way walkie talkies can connect each other in remote area or wild field where phone signal is poor and it has the perfect portable size for outdoor adventures. Motorola TLKR T92 H2O PMR446 Waterproof Two Way Radios. Used UHF DP3400 Radio with Battery, Belt Clip and Antenna. Binatone Latitude 150 (8 Channels) Two Way Radio. With charger and 6 AAA rechargeable batteries. Been clearing garage someone else my find them useful. Never been used. I will only arrange delivery in the UK. The VOX function allows you to keep talking, even when you need both hands free. 16 hours with supplied batteries Weight: 140g without batteries Size: 57 x 171 x 40mm. Water resistant with up to 16 hours battery life. Walkie Talkies. BAOFENG T1 Radio. -1 x Refurbished Baofeng T1 Mini Walkie Talkie. Frequency Range UHF: 400-470MHz. NEW Mini Radio BF-T1. The transceiver is a micro-miniature multiband FM transceiver with extensive receive frequency coverage, providing local-area two-way amateur communications along with unmatched monitoring capability. 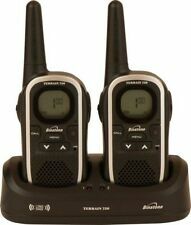 Binatone Latitude 150 Twin Walkie Talkies. The Latitude 150 two-way radio is compact and features a moulded grip on the handsets for ease of use. They have been checked, inspected, repaired (if necessary), graded and reboxed (if necessary) complete with all accessories. Motorola TLKR T80 Extreme Walkie Talkie. Used But Only A Couple Of Times. Motorola TLKR T80 Extreme Walkie Talkie. Condition is Used. Dispatched with Royal Mail 2nd Class. As displayed 4 of with 2 chargers and instructions. 4.5 out of 5 stars - Motorola TLKR T80 Extreme Walkie Talkie. Used But Only A Couple Of Times. 67 product ratings67 product ratings - Motorola TLKR T80 Extreme Walkie Talkie. Used But Only A Couple Of Times. Walkie Talkies. BAOFENG T1 Radio. -3 x Baofeng T1 Mini Walkie Talkie. Frequency Range UHF: 400-470MHz. -3 x PTT Earpiece for free. NEW Mini Radio BF-T1. 5RIII TRI BAND. - Voice prompt. Just Simple Push To Talk Radios. The Motorola TLKR T60 Two Way Radios: Stylish & durable walkie talkies. They could keep in touch when on site. They didn't want to use them! KENWOOD TK-3170 Hand-Held Two-Way Radios. All Radios are in excellent clean used condition. BAOFENG T1 Radio. Walkie Talkies. -1 x Baofeng T1 Mini Walkie Talkie. The transceiver is a micro-miniature multiband FM transceiver with extensive receive frequency coverage, providing local-area two-way amateur communications along with unmatched monitoring capability. RETEVIS RT22, equipped with strong signal short antenna, It is the shortest antenna among all the retevis radios. Superb performance and penetration. Although short antenna, efficient receive signals, also can reach long talking range. Frequency Band: PMR 446MHz. There's even a convenient belt clip to attach your two way radio walkie talkie when not in use, a cool LCD backlit display and a LED lamp. 2 FLOUREON FC200 walkies talkies. Fully working, used only once, unwanted gift. Will dispatch everything what is seen on pictures i.e. 2x Mains Adapter. Binatone Walkie Talkies Latitude 150 Two Way Radio with Charging Cradle. Tested and in good working order. Easy and fun to use and they come with belt clips. Manuals are on line. These come supplied with rechargeable batteries however they are not new. Dispatched with Royal Mail 2nd Class. 6 x USED CLEAN MOTOROLA GP340 UHF 4 WATT PROFESSIONAL TWO WAY RADIOS. UHF 403-470Mhz. Radioswap Ltd do not and have never supplied high power radios on PMR446 or any other LPD frequencies. This covers unlimited sets. BAOFENG T1 Radio. Walkie Talkies. 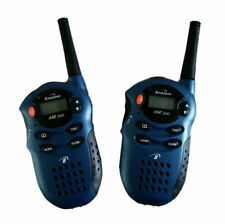 -2 x Baofeng T1 Mini Walkie Talkie. Frequency Range UHF: 400-470MHz. - Voice prompt. The transceiver is a micro-miniature multiband FM transceiver with extensive receive frequency coverage, providing local-area two-way amateur communications along with unmatched monitoring capability. Motorola TLKR T92 Floating Walkie Talkie x2. Brought a few months ago , only used the once on a hiking weekend. Not into hiking and probably never will so selling them, the range was pretty good and was clear . They worked pretty well, charge lasted a couple of days but I suppose it depends how much you used them and how long. We were on them a fair bit. Walkie Talkies. BAOFENG T1 Radio. -4 x Baofeng T1 Mini Walkie Talkie. Frequency Range UHF: 400-470MHz. NEW Mini Radio BF-T1. -4 x PTT Earpiece for free. - Voice prompt. Health & Beauty. Motorola XTR446 (8 Channels) Two Way Radio. Condition is Used. Dispatched with Royal Mail 2nd Class. Motorola XT460 (8 Channels) Two Way Radio x 4. Condition is Used. Dispatched with Royal Mail 2nd Class. This is for 4 radios. They all come with chargers and are in very good working condition. This listing is for 4 radios. Brand new. 2 x Motorola TLKR T92 Licence-free 2 Way Radios H20 10km Twin. Please see excellent feedback and buy with confidence. Motorola sealed units. Collection from Erdington, Birmingham. Any questions please ask. 5 out of 5 stars - 2 x Motorola TLKR T92 Licence-free 2 Way Radios H20 10km Twin. 12 product ratings12 product ratings - 2 x Motorola TLKR T92 Licence-free 2 Way Radios H20 10km Twin. Motorola GP68 UHF 440MHz 4W 20 Channels 2-Way Radio Accessories W/O BATTERY. Condition is Used. THESE ARE GP68 RADIOS. Radio to Radio Cloning. Receive Signal Strength Indicator (R.S.S.I.). 20 Channels. “P14XTA03A1AH” Type XTNiD. 1 X MOTOROLA MODEL: “P14XTA03A1AH” with the Display screen. Type XTNiD. The XTNiD is a 16 channel two way radio by Motorola with a Tri-coloured LED interface that allows you to identify radio features and status. 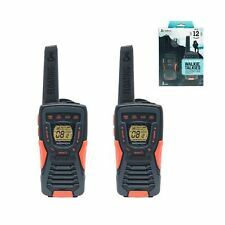 Binatone Twin Walkie Talkie (Latitude 850) - Free P&P to EU - RSP €94.95!